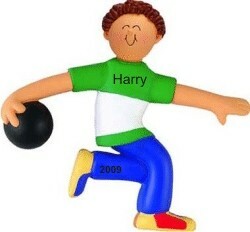 If we take the concept of bowling as throwing an object toward other objects with the goal of coming "the closest without touching", bowling dates back to known Roman times as it's mentioned as a favorite pastime amongst Roman soldiers occupying distant lands. Something similar to balls and objects was discovered in an Egyptian child's tomb, so there's an apparent 4000 year+ history. From this tradition we see curling and English lawn bowling as well as today's indoor bowling alleys. The actual regulation of bowling balls and pins to knock over was first created and standardized in 1895 in the US. Today the game is played on every continent by millions of fans. 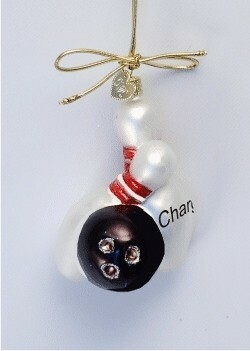 Our bowling ornaments are designed for both men and women, ranging from inexpensive resin to higher-end blown glass. 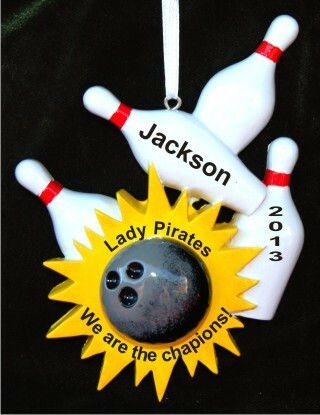 Bowling Christmas ornaments can be personalized with the bowlers name, the year, and if desired the bowling team's name or competition or tournament won. For both kids and adults, we can extend discounts for bulk and wholesale orders. 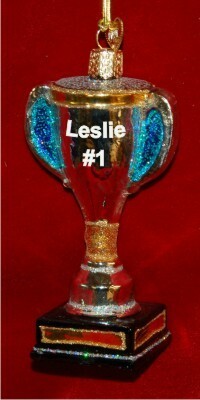 Our bowling favors can be personalized with each party guest's name if desired, or you can personalize each bowling Christmas ornament with the birthday boy or girl's name as a thank-you gift for young guests. 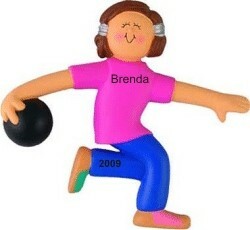 For mature party guests, we suggest personalizing each ornament with a fun or whimsical party name like, "Janet's Bowling Bash" or something similar. Each of our bowling ornaments arrives in our exclusive black velvet bag ready to make an easy and fun bowling party favor.